First time playing at Mitcham, and it turned out to be a fairly pleasant experience. Mostly you're playing to fairly generous fairways, although there are a few where you might be wondering about the tram lines bordering the course. You certainly won't have to worry about any climbs, as the terrain is as flat as they come. I say flat, although some of the fairways are often anything but, and on days when the ground is firmer I can imagine a few unusual bounces. The greens seem to have a lot of protection from numerous bunkers, but miss those and you'll be playing on really good greens. I was surprised how good they were given that we're in the back end of January, and they are a total credit to the greens staff. There is one stretch, over the other side of tram lines, where the holes seem to cross each other. There's also one hole, the 7th I think, where you have a small copse of trees guarding the green. Otherwise the course is good without being great, and there are only a few memorable holes. It's certainly worth playing though. The clubhouse is certainly decent, but the toilets and changing areas look like they've just been refurbished and have a “I wasn't expecting that” wow factor. I can only speak for the Men's changing rooms, btw. Too Quirky - acceptable but not my cup of tea! 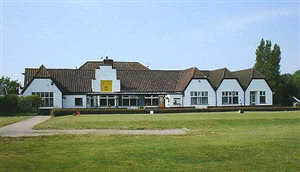 Mitcham GC is a par 69, 5,931 yards parkland proprietary club in Mitcham Surrey. The course was founded in 1891 and designed by the legendary Tom Morris. The SSS for the course is only 67. The course is located adjacent to the Mitcham Junction tram and main rail stations. The course is bounded by two unfenced main roads, ie Croydon Road and Beddington Lane, necessitating extreme caution of the 4th and 13th tees in particular. The course is divided by the Croydon Tramlink rail line where holes 6-9 are formed of a four hole loop of quirky composition and where the 9th tee shot is adjacent to the rail track . The fairways are generally firm but are very undulating and given to awkward bounces turning seemingly good tee shots into nightmares. Trees, ditches, and long grass abound. The course is a very level walk with no serious changes in course elevation though many of the greens are raised. The course lacks a WOW element but that said the 2nd, 5th, 10th, 11th, 13th, 14th and 17th are very challenging holes. I first played the course about 30 years ago and the greens were excellent then and are still in excellent condition now. Some adhoc animal hoof marks on most of the greens were an unavoidable factor. The quirkiness of the course comes from the fact that some of the tee shots criss-cross over fairways of other holes but also the four hole loop and the close proximity of tees to greens have a safety impact on pace of play priority etc. The clubhouse is enjoyable and catering is OK. Given a choice on nearby pay and pay proprietary courses I would much prefer to play Oaks Parks, Richmond Park, Hampton Court Palace or Surrey Downs ahead of Mitcham but it is a good fall back option for a society or for a once a year venue. The South East Swing group paid a £30 green fee. Reasonable for a weekend but midweek should be much cheaper/better vfm. This is a classic case of a course which could do with a layout redesign for safety reasons but the resources will probably never be available to the club for such an enterprise. Play it and judge for yourself. Very pleasant and well maintained golf course. Great value for money, especially the twilight fee after 1pm (2pm weekend).